February 29, 2012 December 22, 2015 / Julie Brook, Esq. Disability discrimination is among the most complicated areas in employment law today. One of the reasons for all this complication is because the laws require that employers and employees engage in an interactive process. The interactive process can be a daunting endeavor for employers. Here’s a 15-step approach to take employers through this process. The laws relating to disability discrimination — the Americans with Disabilities Act of 1990 (ADA) (42 USC §§12101-12213), the ADA Amendments Act of 2008 (ADAAA) (Pub L 110-325, 122 Stat 3553), and the California Fair Employment and Housing Act (FEHA) (Govt C §§12900-12996) — all seek to provide equal opportunities to employees and applicants with mental or physical disabilities. 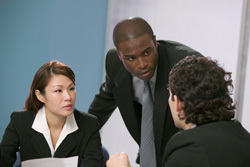 These laws are unique because, in addition to the anti-discrimination and harassment components, they also require that employers and employees engage in an interactive process to determine whether the employee is entitled to a reasonable and effective accommodation that will allow him or her to perform the essential functions of the job in question (or will allow an applicant equal access during the interview process). As the term implies, this process should be interactive, with both sides mutually responsible for engaging in a two-sided, open dialogue. The applicant or employee has the responsibility to communicate with the employer on the nature of his or her limitations and the accommodations needed; the employer has an obligation to have a system in place to communicate effectively with applicants and employees and to properly analyze reasonable accommodation requests. The employer needs to make sure the parties are communicating interactively, rather than engaging in a one-sided conversation (without the employee’s involvement). Every employer should have established policies or consistent practices on these issues, which should be reviewed and updated as necessary on a regular basis. Identify the company representative who will manage the interactive process. Identify other company representatives (e.g., supervisors, translators) who may need to participate in the process. Maintain a log documenting all communications and actions during the course of the interactive process. Promptly return phone calls or e-mails from the employee. Review the company’s policies and procedures (and past practices) on the interactive process and disability accommodations. Review the applicant’s or employee’s written requests (if any) or other third party written documentation on his or her need for accommodations. Communicate with the applicant or employee on the evidence of his or her potential need for accommodations and to generally introduce the interactive process. Confer with the applicant or employee to determine his or her restrictions and limitations, including whether or how they affect the ability to perform the position’s essential functions (or equal participation in the application process). When evaluating the applicant’s or employee’s suggestions (if any) on ways the identified limitations can be accommodated, don’t ask for the applicant’s or employee’s medical diagnosis or information on his or her medical history that might infringe on the employee’s privacy rights. Ensure there’s sufficient evidence to support the applicant’s or employee’s reported limitations. Otherwise, ask for additional evidence to determine the reasonable accommodations available to the employee to overcome his or her limitations. Be consistent in your requests for information. If applicable, analyze the employee’s job position to distinguish between its essential and marginal functions. To do this, review the job description and consult with the employee’s supervisor. Be cautious about modifying a position’s essential functions after an employee requests accommodations. Analyze whether the applicant’s or employee’s suggested accommodation(s) effectively enables him or her to perform the essential functions of his or her position or participate in the application process. If necessary, identify other potential accommodation(s). Review the company’s general history of accommodating applicants and employees, especially other similar requests (if available). Keep in mind, however, that the assessment should be individualized. After an accommodation is determined to be effective, analyze whether it will pose an undue hardship to the employer. After the analysis of the effectiveness and potential undue hardship of the accommodation, offer the applicant or employee the best, most effective accommodation—that is, the one that adequately enables him or her to effectively perform the position’s essential functions or to participate in the application process. Meet or otherwise confer with the applicant or employee to discuss the employer’s reasons for the selected accommodation and any concerns the applicant or employee has regarding that accommodation. To the extent that the applicant or employee has concerns about the accommodation, conduct additional analysis to determine whether the selected accommodation can be modified to address those concerns or whether another accommodation might exist. Draft and send letter to the applicant or employee confirming the accommodation provided, reminding him or her of the employer’s commitment to the interactive process, and requesting immediate notification if additional or alternative accommodations are needed. Conduct follow-up consultation with the applicant or employee to determine whether the accommodation as implemented is effectively enabling him or her to perform the position’s essential functions or to participate in the selection process. CEB has got employers and their attorneys covered on this issue — with a form letter, a diagram of the interactive process, and a sample interactive process log in its new book Drafting Employment Documents for California Employers, chap 6. Also check out Advising California Employers and Employees, chap 15. And check out CEB’s program Employment Law Practice: 22nd Annual Recent Developments, available On Demand. ← Is a Lien Leaning on Your Case?